The final City and Gateway Urban Design Framework was jointly launched on 19 December 2018 by Mick Gentleman MLA, Minister for Planning and Land Management, and Senator the Hon Zed Seselja. The Framework recognises the significant opportunities the city centre and the gateway corridor of Northbourne Avenue and Federal Highway presents for urban renewal, growth and investment in the city centre, by enabling more people to live and work close to sustainable transport options, services and infrastructure. The Framework builds upon feedback from Stages 1 and 2 of community engagement and utilises a people-first approach to ensure high-quality design in buildings, public places and streets in the city centre and gateway corridor of Northbourne Avenue and the Federal Highway. To find out more about the final Framework and next steps visit the City and Gateway Urban Design Framework website information. Support for improving the safety and convenience of walking and riding bicycles for people of all ages and abilities. Support for high architectural quality and sustainable building design that contributes positively to public places and streets. A desire for convenient access to and provision of well-maintained open spaces and landscape amenity to support a diverse range of passive and active recreation, in particular related to Sullivans Creek, Haig Park and urban place activation, such as pop-ups and curated outdoor events. A desire for adequate community facilities and social infrastructure to support a diverse community. A lack of housing choice with poor built form and sustainability outcomes in new developments. Increased traffic congestion and impacts on local traffic flows and parking. Lack of pedestrian amenity, especially related to east-west connections across Northbourne Avenue. Changes to bus services following the introduction of light rail. A people-first approach to the planning and design of the Northbourne corridor, with priority for walking and cycling, good quality public spaces and social infrastructure to foster active and healthy communities. A placemaking approach to create public places and streets as people-friendly destinations with high amenity, supported by investment in the open space networks and urban parks. A 'city in the landscape' approach ensuring development contributes to the landscape setting with most building heights sitting below the tree line of the urban forest. A planning and design framework guiding development to incentivise design quality and innovation in sustainability. A city and gateway movement network boosting the overall efficiency, effectiveness and safety for all travel uses, including walking, cycling, public transport and vehicles. The implementation of the final Framework will require changes to planning provisions which apply to the corridor and city centre. This includes an amendment to the National Capital Plan by the NCA and a variation to the Territory Plan by the Environment, Planning and Sustainable Development Directorate to give any new planning controls statutory effect. These processes will run concurrently and there will be further opportunities to have your say as part of community consultation on these changes to planning controls. Further implementation initiatives will involve physical and social infrastructure upgrades that will be coordinated with the City Renewal Authority, Transport Canberra and City Services Directorate and other government service providers. These will include improvements to roads and active travel infrastructure, Northbourne Avenue verge upgrades, enhancement of the Sullivans Creek open space network, upgrades to Haig Park and further planning for and delivery of social infrastructure, such as school, sport and health facilities, in the city and gateway corridor. What is the purpose of the City and Gateway Draft Urban Design Framework? What geographic area does the draft framework cover? Why has the National Capital Authority and ACT Government collaborated on the framework? What is the general approach to development and built form along the corridor? Are there changes proposed to building heights proposed along the corridor? What are current and proposed building heights along Northbourne Avenue and Federal Highway? What building heights are proposed for the Macarthur Urban Village? Will there be changes to planning controls that apply to the city centre and gateway corridor? How many more people could live along the gateway corridor with the new plans? The purpose of the Draft Framework is to set out the overarching principles for urban renewal and growth in the city centre and along the gateway corridor to achieve well designed and sustainable buildings, urban infrastructure, public places and streets. The study area includes the city centre and the linear corridor roughly 1km east and west of Northbourne Avenue, extending from the shores of Lake Burley Griffin to the Federal Highway up to the ACT/NSW border. The National Capital Authority (NCA) and the ACT Government partnered as both have interests within the study area. 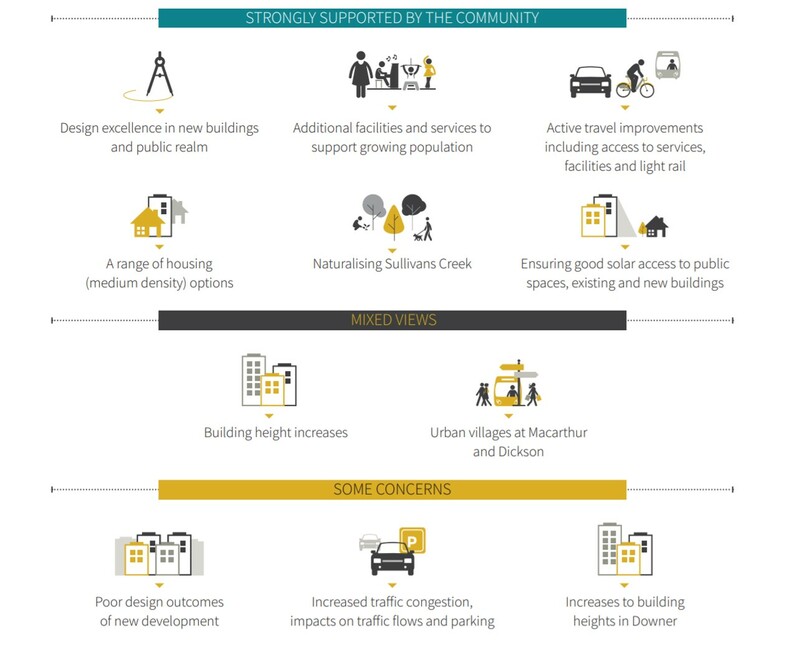 A joint framework ensures that the interests and expectations of both the NCA and ACT Government are reflected in a single urban design framework. It is proposed that development from the NSW/ACT border to the city centre will progressively transition from an informal bush and grassland character to a formal, structured boulevard. This transition will be achieved through changes in building height, setbacks, and landscape character. Only minor building height increases are proposed for Macarthur urban village and the corridor north of Antill Street for blocks next to light rail. Urban villages are identified near Macarthur and Dickson light rail stops as a focus area for mixed-use development and activity hubs in convenient and attractive locations next to services. The proposed Dickson and Macarthur locations will have improved pedestrian and cycle links to existing neighbourhoods to complement renewal along Northbourne Avenue. Yes, some selected building height increases are proposed for Northbourne Avenue corner sites at Macarthur/Wakefield Avenues, northern investigation areas in North Lyneham, at Exhibition Park in Canberra (EPIC), for blocks in Downer fronting Northbourne Avenue, and for the back of blocks fronting Northbourne Avenue that interface with residential areas. The proposed building heights map can be found on page 28 of the Draft Framework. The National Capital Plan (managed by the National Capital Authority) currently requires that building heights along Northbourne Avenue are not higher than 25m (max. 9 storeys). Two ‘landmark nodes’ at the intersections of Mouat/Antill Streets and Macarthur/Wakefield Avenues and Northbourne Avenue currently allow for buildings up to 32m (max. 11 storeys) in height. The requirements of the Territory Plan are to be consistent with the National Capital Plan and stipulate a 25m building height for CZ5 Commercial mixed use zoned sites fronting Northbourne Avenue, which steps down to a building height of 12m (max. 4 storeys) at the back (where it interfaces with RZ4 and RZ3 medium density residential zones). However the related criteria already allows for heights greater than 12m. Increasing the building height provision for sites at the back of Northbourne Avenue from 12m (approximately 4 storeys) to 18m (approximately 6 storeys) is proposed in the Draft Framework to prpvide a clear direction for an appropriate and consistent interface and step down to the medium density residential areas (RZ4 and RZ3). It is also proposed to allow for a building height increase of 10% to the current 25m buildings heights (that is 27.5m), which does not change the number of permitted storeys but ensures better design outcomes with increased floor to ceiling heights, especially for ground floor areas. Four marker building at the corner blocks of Northbourne Avenue and Macarthur/Wakefield Avenues are proposed to increase in height from currently 32m (max. 11 storeys) to RL617 or approximately 44 to 48m (15 storeys) to mark this important urban village. Downer blocks fronting Northbourne Avenue/Federal Highway are proposed to increase from existing 8.5m (max. 2 storeys) to 18m (max. 6 storeys) with marker buildings of 22m (max. 7 storeys) at the southern corner sites of Federal Highway and Phillip Avenue. This is a long term proposal that is consistent with the changes to heights proposed on the North Lyneham side of the corridor. The proposed heights for the four corner buildings at the Macarthur urban village site is proposed to increase from currently 32m (max. 11 storeys) to between 44m and 48m (approximately 15 storeys) or equivalent to RL617. This 617 metres above sea level is the maximum height permitted in the city centre under the National Capital Plan, and is equal to the height of the flagpole of Parlament House. The implementation of the final Framework will require changes to planning provisions which apply to the corridor and city centre. This includes an amendment to the National Capital Plan by the National Capital Authority and a variation to the Territory Plan by the Environment, Planning and Sustainable Development Directorate to give any new planning controls statutory effect. These processes will run concurrently and there will be further opportunities to have your say as part of community consultation on these changes to planning controls. Within 15 years, an extra 17,000 people are expected to call the corridor home. The Draft Framework ensures this growth is accommodated in a coordinated manner and in a way that maximises benefits to the broader community. Come and have your say and talk to one of our planners at the ‘Meet the Planner’ sessions.